Digital Digest -> Articles -> FAQ: What exactly is on a DVD disc? FAQ: What exactly is on a DVD disc? Page 1 of 1: FAQ: What exactly is on a DVD disc? What exactly is on a DVD disc? What are all those different files, such as .VOB, .IFO, and .BUP files? Why isn't there anything in the "AUDIO_TS" folder? 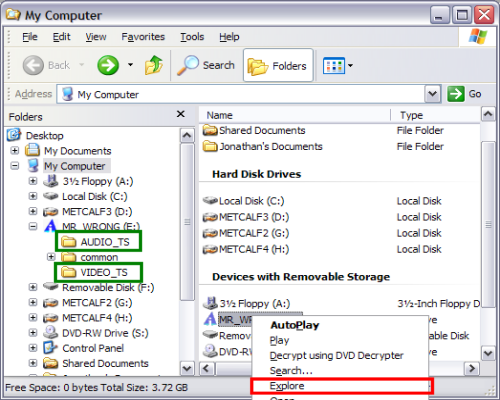 When you explore the DVD drive you'll see at least 2 directories, an "AUDIO_TS" folder and a "VIDEO_TS" folder (and possibly some other files/folders). AUDIO_TS is used for DVD Audio and contains DVD-Audio files in the form of .AOB. In a normal DVD Video, there are no files in AUDIO_TS. 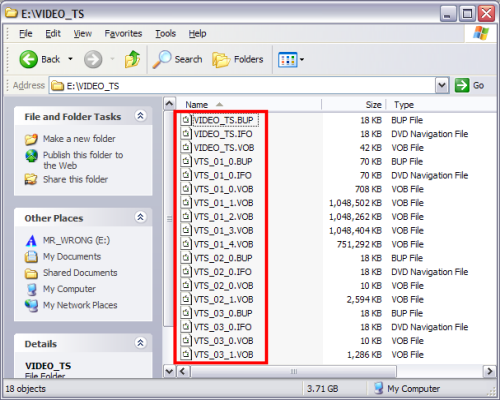 VIDEO_TS is used to store all data for the movie and extras (.VOB files are the container files that hold the audio, video and subtitles). As you can see there's 3 types of files on a DVD: .VOB, .IFO and .BUP . For more information on MPEG-2 Video, please see here. The audio on a DVD can be AC-3 (Dolby Digital), Linear PCM (uncompressed audio), DTS or MPEG-2 audio (MP2). AC-3 is very much the standard. LPCM is mostly found on music DVDs and MP2 on cheaper productions. LPCM is high quality uncompressed audio which takes a lot of space, hence it's not an ideal choice for full length movies with extras and possibly multiple languages. AC-3 streams have a bitrate between 192 and 448kbit/s. 192kbit/s is used for 2 channel sound, and 384-448kbit/s for 5.1 channel surround sound. For more information on audio on DVDs, see here. A .VOB file contains one main video stream and may also contain several multi-angle streams, allowing you to switch the perspective during the movie. This feature is mostly used to display storyboards or other extra features during playback. The maximum bitrate of the video stream is 9.8Mbit/s. Together, video, audio and subtitle streams must be below 10.08Mbit/s at any given moment. It's possible to have up to 8 different audio streams and you can usually switch the audio stream during playback. It's also possible to have up to 32 different subtitle streams. Subtitles are 4 color bitmaps which are overlayed over the video stream - they're usually not encoded into the video stream. .IFO Files give the player important navigational information, like where a chapter starts, where a certain audio or subtitle stream is located, etc. IFO files are not encrypted. 1. Length: 02:07:15:24 in 15 cell(s). 2. Length: 00:00:30:01 in 1 cell(s). As you can see there's 2 PGCs or ProGram Chains in this movie. PGC 1 represents the main movie whereas PGC 2 is the studio logo at the beginning. The structure can be a lot more complicated. Multi-angle movies will give you several PGCs having the same length, and seamless branching movies several PGC with different length. By selecting the right PGC you can get the right version of the movie. The best tool to examine the structure of your DVD is PgcEdit. BUP files are just back up files of the IFOs (they are straight duplicates of them). Just like .IFO files, they are not encrypted. There's other IFO files: VTS_01_0.IFO through VTS_05_0.IFO in this case. The first 2 numbers in the name tell the Video TitleSet number -- VTS_01_* is Titleset 1, VTS_02_* is Titleset 2, etc. There can be a maximum of 99 titlesets (01-99). Each titleset can have 10 VOB files (numbered from 0 to 9), first (VTS_XX_0.VOB) being a menu for that Titleset. Each Titleset has at least 1 VOB and exactly 1 IFO and BUP file. A Video Titleset is a container for a number of Titles. The maximum number of Titles on a DVD is also 99 - these can be all in one Video Titleset or spread around the DVD. In our case VTS 1 contains the main menu and the movie (together 5.4Gb - this is obvious by its size). Titleset 2 contains a behind the scenes featurette (1.2Gb), also with its own (small) menu. Titleset 3 appears to have little in it and probably only contains navigational data in the IFOs. Titlesets 4 and 5 probably contain the Dolby Digital and DTS trailers (28Mb and 18Mb). You can see what's what by looking at these in PgcEdit or your software player. A VOB file must be less that 1 Gb = 1,048,576kb (= 1024 x 1024 x 1024 bytes). DVD video content is broken into Titles and Parts of Titles (chapters). Titles are made up of cells linked together by one or more Program Chains (PGCs). A cell is the smallest video unit referrable on a DVD. Often a cell is equal to a chapter but not always. Cells are grouped together using VOB IDs. Cells are made up of a collection of VOBUs (Video OBject Units), which themselves are made up of Groups Of Pictures. There is usually 1 GOP per VOBU (lasting 0.4 seconds long). GOPs are made up of Frames . There are 3 types of frame - an I frame (which is a full frame) and B and P frames (whch are predictive frames based on the I frame). Within the frames are Video, Audio and Subpicture Packs, the basic building block of a DVD, each pack being exactly 1 sector (2kb) in size. This article was adapted from an original at www.doom9.org - thanks to them!